A tattoo involves introducing pigment into the dermis layer of the skin to permanently change the colour of the skin. It can be done in several ways, including hand poking, hand tapping, scarification and ink rubbing and electric machine tattooing. We can assist you with any of these at Holier Than Thou but primarily this article shall discuss electric tattooing. Tattooing is a permanent body modification and is only performed on 18+ individuals who hold valid photographic identification, it’s the law! Unlike some studios, we operate a very strict hygiene regime that is similar to that of an operating theatre and we would welcome you to tour our studio and ask about our techniques before booking in for a tattoo. We have a separate sterilization room that houses our cold soak tanks, ultrasonics and autoclave machines. All artists have first aid, cross contamination and pathogen training and impeccable aseptic techniques to ensure your safety. We use industrial HEPA filters and Medivent air filters to ensure the very air you breathe is as free of airborne pathogens as possible. All surfaces are designed to be wiped down with medical grade biocide after each client and the flooring and grout (where present) is hospital grade. We believe in doing what is best for the client, not best for our pocket, and we will be honest in regards to the tattoo you are considering. If we believe it needs to be altered to work as a tattoo for the rest of your life, we will be honest! We will also be here for years to come should you have any queries in relation to the aftercare or upkeep of your tattoo. We have two permanent skilled artists who each specialize in different styles – check out their extensive portfolios in our online gallery and in person the studio. We occasionally arrange for guest artists to visit, this is always well advertised at FACEBOOK, give us an add! Good Tattoos Are Not Cheap. Cheap Tattoos Are Not Good. You might be surprised at how affordable a good tattoo can be! All quotations are free of charge and our artists are ever-so friendly, so pop in for a chat with our artists or email hello@holier-than-thou.co.uk for an obligation free quote. We want you to have the very best result from your lovely new ink, in order for it to heal crisp and clean, it’s really important that you look after it. It will take just 10-14 days for your tattoo to heal. Remember: A tattoo is an open wound, and is at risk of infection until it is fully healed. Once the tattoo is finished, your artist will apply a protective covering. Leave this in place for at least 2 hours, or until you get home. It may be very tempting to remove the covering sooner whilst you’re out with friends to show them, but please resist the urge! Once you get home, remove the covering and immediately wash the tattoo with lukewarm water and a mild antibacterial handwash such as Simple or Carex – use only as per the manufacturer’s instructions and if irritation occurs, discontinue use immediately. You could also wash with H2Ocean Blue/Green Foam Soap. Use your soft hand (no wash cloths) to gently massage away any plasma, blood and ointment and leave the skin perfectly clean. Rinse with clean lukewarm water & make sure no soap is left on the skin. Use a fresh, clean, lint-free towel to gently PAT dry your new tattoo – do not rub it. Ensure the tattoo is completely dry and immediately apply aftercare ointment. When applying your aftercare ointment, be sure only to apply a very small amount and massage it well into the skin until it is no longer shiny. You should not be able to see or feel the ointment on the skin after it has been rubbed in. Applying too much ointment can stop the skin from breathing properly and can cause little red pimples to form – when the pimples go away, the ink has often gone with them, leaving a dotted tattoo result! You could use Bepanthen ointment as this has been used to heal tattoos for many years, however this is a nappy rash cream and isn’t strictly designed for open wounds. It has been linked to contact dermatitis in people with sensitive skin and because its quite thick and gloopy you’re more likely to apply it too thick and have an issue with red pimples. 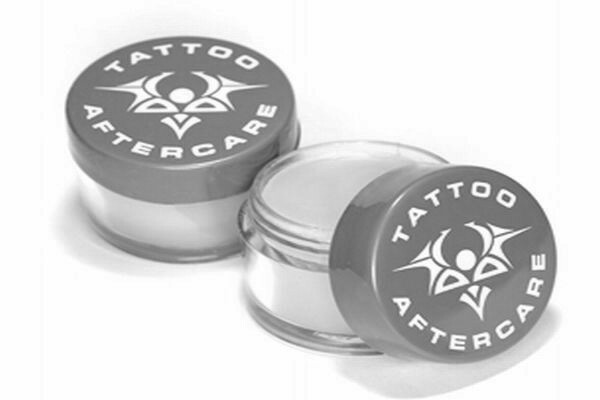 Hemp Company Tattoo Aftercare – all natural ingredients, nourishes and moisturises the skin whilst providing natural antiseptic, bactericidal and analgesic care. H2Ocean Ocean Foam Tattoo aftercare or H2Ocean Aquatat or H2Ocean Ocean Care – Water based, promotes skin health, high in antioxidants, fragrance free, natural ingredients, anti-inflammatory, antibacterial. The Ocean Foam tattoo aftercare is our favourite, as it’s packaging allows the product to remain sterile until the very last pump, and contains an enzyme called Lysozyme which fights bacteria. Throughout the healing phase, wash your new tattoo 2-3 times daily and apply aftercare ointment after each wash. You may also need to apply the aftercare ointment between washes if it feels dry at any point. The tattoo will scab as it heals but these should be kept as small as possible by ensuring it is properly coated in ointment at all times – big scabs will form if you do not, and these should be avoided (as they can cause the ink to fall out). After a few days, when washing or applying ointment to your tattoo you might find small scabs coming away from the tattoo in your hand – don’t panic, this is normal and a sign of the tattoo healing! DO NOT PICK OR SCRATCH YOUR TATTOO WHILST IT IS HEALING! The little scabs need to come off on their own or else you can risk pulling the ink out and leaving the area scarred. After the scabs come off in little sections, the tattoo immediately beneath may look ‘fuzzy’ at first – this is completely normal and will tighten up again throughout the secondary healing phase. This normally takes just a few days but the ink will “settle” for up to three months. You can shower as normal with your healing tattoo – its perfectly fine to get the tattoo wet for short periods of time, however DO NOT SOAK YOUR TATTOO. Submerging your tattoo in a bath, swimming pool or hot tub can cause serious damage to your new tattoo. Likewise, do not subject your tattoo to fake tan or a hot humid environment like a sauna or steam room for at least 2-3 weeks. After your tattoo has healed, you need to keep it looking lovely for years to come! Its really important to protect your tattoo from the sun – this includes sunbeds! Ultraviolet rays break down and fade a tattoo with astonishing speed – especially any soft delicate sections leaving you with a patchy tattoo. Be sure to wear a high protection sunblock (minimum 30SPF+) at all times in sunny conditions to make sure your tattoo is lovely and vibrant for years to come. If you are ever in any doubt in regards to your tattoo (regardless of where it was done or what advice you have been given) please pop in and see us! We will always help as much as we can.